The Ministry of Education, with assistance from the Republic of Korea, recently renovated 13 schools in the Kilinochchi District. Situated in a district that was once home to the headquarters of the terrorist organisation known as the Liberation Tigers of Tamil Eelam (LTTE), these schools had been in a dilapidated condition due to the near-30-year conflict. The following schools had benefitted: St. Theresa’s Girls’ College Kilinochchi, Sivanagar Government Tamil Mixed School, Bharathy Vidyalaya Kilinochchi, Ramanathapuram West Government Tamil Mixed School, Konavil Government Tamil Mixed School, Ramanathapuram Maha Vidyalaya, Vaddakkachchi Maha Vidyalaya, Piramanthanaru Maha Vidyalaya, Tharmapuram Maha Vidyalaya, Murugananda College, Veravil Hindu Maha Vidyalaya, Iranaitivu Roman Catholic Tamil Mix School and Kiranchi Government Tamil Mixed School. A timely act to strengthen the reconciliation process. Opening ceremony of Northern Province Trilingual Learning Centre was held on 19th March 2014. 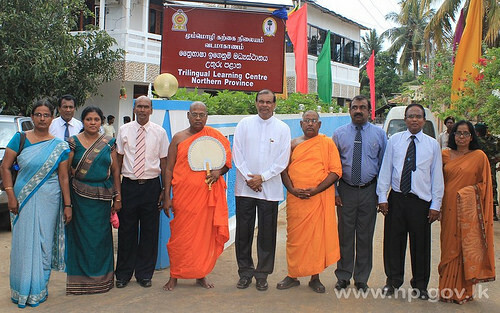 Governor of the Northern Province GA Chandrasiri officially declared open the learning center. 16th International Photographic Exhibition was commenced in Jaffna Hindu College on 22nd February 2014. Chairman of the Northern Provincial Council CVK Sivagnanam inaugurated the exhibition by cutting the ribbon. Mayoress of Jaffna Municipal Council Mrs.Y.Patkunarajah, the President of the National Photographic Art Society of Sri Lanka (NPASSL) T. G. Sunil Wickrama, International Photography Exhibition Executive Director Ranjith Abyasinga graced the event as guest of honours. 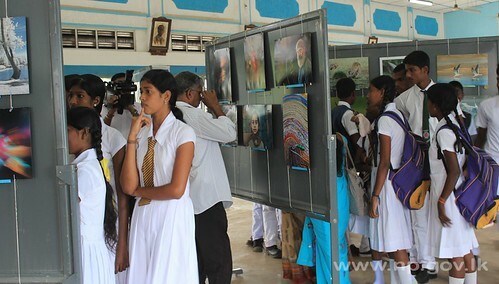 This exhibition has been organized in Jaffna under the guidance of the Governor of the Northern Province GA Chandrasiri. Large number of students visited this gallery. The exhibition will be available for 2 days (22nd – 23rd February). Amidst a number of meetings of Divisional Secretariat Reconciliation Committees in the North last week, I also had a number of interactions with children, and with persons working with children. Two instances were serendipitous, but I was privileged to participate actively – and indeed exhaustingly – on one occasion. This was when I conducted, in a small school near Nedunkerni, one of the games that the former combatants had delighted in, during my first visit to the Rehabilitation Centre for girls in Vavuniya three and a half years ago. The laughter of the girls on that occasion still illuminates in presentations of the Rehabilitation Bureau, as I saw last month at the Officer Career Development Centre Seminar at Buttala. In Nedunkerni the children were younger, and even less inhibited. Amongst the recommendations developed at the consultations on Human Rights arranged by the Consortium for Humanitarian Agencies that were held in my office a few weeks back, perhaps the simplest to implement swiftly is that about the lack of well-trained counselors for children. It is true that the Education Ministry has set up a system of counselors in schools, but training has been minimal in some cases, and there are no clear guidelines as to how they should be used. Counselors need to work in collaboration with the teachers who are most likely to be a child’s first point of reference, while they should also have access to social workers from the relevant Ministries as well as well as medical personnel in the field. In addition, it would be useful if the education system worked more coherently in developing peer group support mechanisms, in particular through the entrenchment of extra-curricular activities that ensured socialization through cooperation.